Sarah Nader - snader@shawmedia.com Aimee Jenchel, 23, of Lake in the Hills walk with Mackeben Elementary School student Lexi Woodbury while working with the Huntley Park District's Extended Time program in Algonquin Tuesday, May 2, 2017. Jenchel is a graduate of the LIGHT program and has been working at the Huntley Park District for about four years. The program is a transition program for special education students 18-21 who have the credits to graduate, but delay accepting their high school diploma. Since the program started in 2013, it’s been recognized by ISBE and helped all of its students find jobs after high school. 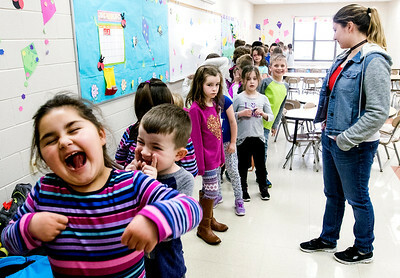 Sarah Nader - snader@shawmedia.com Aimee Jenchel, 23, of Lake in the Hills gets the students to line up while working with the Huntley Park District's Extended Time program in Algonquin Tuesday, May 2, 2017. Jenchel is a graduate of the LIGHT program and has been working at the Huntley Park District for about four years. The program is a transition program for special education students 18-21 who have the credits to graduate, but delay accepting their high school diploma. Since the program started in 2013, it’s been recognized by ISBE and helped all of its students find jobs after high school. 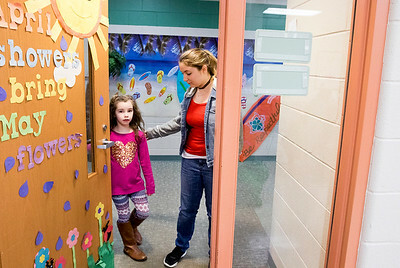 Sarah Nader - snader@shawmedia.com Aimee Jenchel, 23, of Lake in the Hills works with the Huntley Park District's Extended Time program in Algonquin Tuesday, May 2, 2017. Jenchel is a graduate of the LIGHT program and has been working at the Huntley Park District for about four years. The program is a transition program for special education students 18-21 who have the credits to graduate, but delay accepting their high school diploma. Since the program started in 2013, it’s been recognized by ISBE and helped all of its students find jobs after high school. 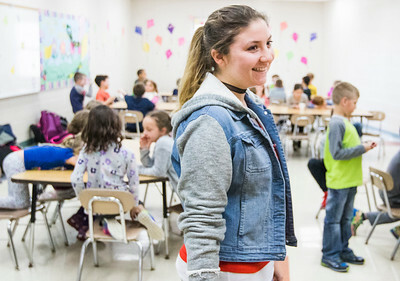 Aimee Jenchel, 23, of Lake in the Hills works with the Huntley Park District's Extended Time program in Algonquin Tuesday, May 2, 2017. Jenchel is a graduate of the LIGHT program and has been working at the Huntley Park District for about four years. The program is a transition program for special education students 18-21 who have the credits to graduate, but delay accepting their high school diploma. Since the program started in 2013, it’s been recognized by ISBE and helped all of its students find jobs after high school.